Today, Razer unveiled “Project Ariana”, world’s first video gaming projection system with a high-definition video projector. It adapts the projection of in-game elements to the dimensions and features of the physical environment. 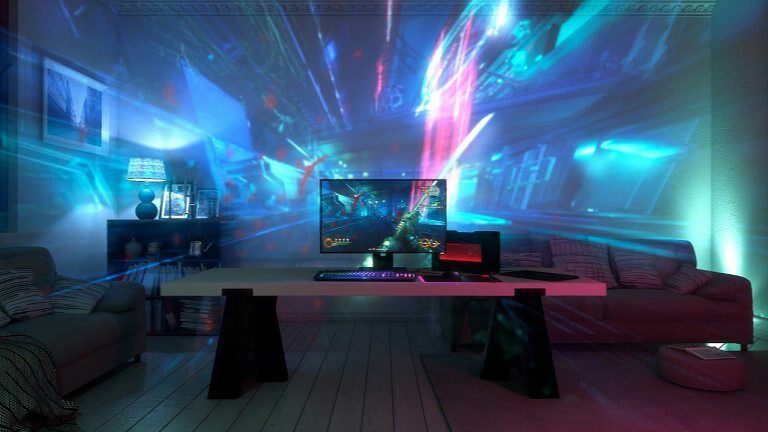 Razer is also bringing Chroma lighting to the entire room with Project Ariana. Chroma is the company’s multi-colored lighting feature for Razer’s products, like mice, headphones, laptops, keyboards, and more. With the help of Chroma, the user to configure the color scheme with up to 16.8 million colors, in a variety of zones, or even per-key lighting schemes, all controlled through the Razer Synapse software. The technology also uses a pair of 3D depth sensing cameras along with proprietary calibration software automatically calibrates itself to detect environmental factors such as furniture and room lighting.